1) Preheat oven to 180oc. Rub butter into flour until you have a fine breadcrumb texture. Stir in sugar, egg. Then mix in orange juice in gradually, until you have a smooth dough. 2) Roll out dough until about 2mm-5mm thick. Using a biscuit cutter, cut out a round, then use a different shape to cut out the middle. Make a small hole at the top using a skewer, to allow you to thread ribbon/thread through later on. Place on baking tray lined with baking parchment. 3) Place a boiled sweet in the middle of each biscuit. bake for 15-20 min. Allow to cool on baking sheet. Chestnuts exploding on an open fire. This might sound like a dumb question but are these edible? If so, how long/well do they ‘keep’ on the tree? They are very much edible. 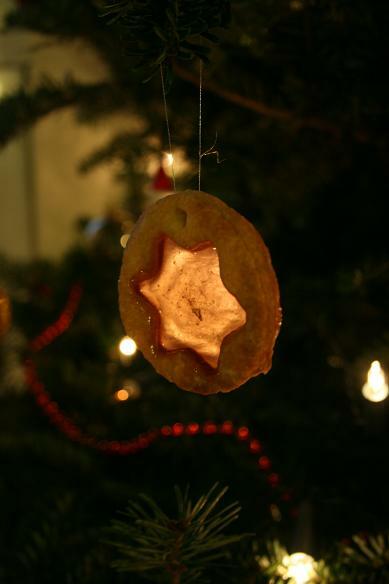 Last years ours stayed on the tree for 2 weeks, but the biscuit does begin to go soft and the glass bit goes sticky so if you want to eat them at their best eat fresh.